The Mauna Lani Resort is on the Pacific Ocean in Hawaii, on the Kohala Coast. The resort was designed to include as much of the ocean as possible, from its guest rooms, suites, and bungalows with floor to ceiling views to its open-air dining options. The resort has a full-service spa and salon, a state-of-the-art fitness center, tennis club, and multiple golf courses, and many different water sports and activities. There are three categories of accommodations at the Mauna Lani Resort - guest rooms, guest suites, and bungalows. The guest rooms offer guests the choice of views of the mountains, gardens, or ocean. The most affordable of those options is a standard room, with views of the Mauna Kea Mountains. There are two varieties of guest suites at the resort - Ocean View and Ocean Front. Both suite types are located on the upper floors of Mauna Lani and have separate living areas and bedrooms. There is also a wet bar in each of the suite styles. They also each have private balconies. Resort guests seeking a more private experience can rent one of the luxury bungalows. Each bungalow is a spacious 2700 square feet of indoor space and an additional 1300 square feet outdoor space with a BBQ, private pool, and jacuzzi. Guests can choose from Ocean View or Ocean Front bungalows, which each have two master bedrooms and two master bathrooms. In addition to the nightly cost of accommodations, the resort also charges guests a daily charge for the resort activity package. The cost covers a variety of amenities at the resort, including either self-parking or valet for one car, basic in-room internet access, and toll-free and local phone calls. 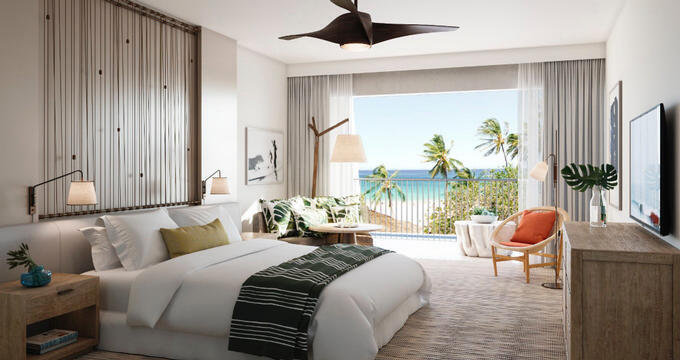 It also gives resort guests access to beach-related amenities, which includes a private double beach cabana, snorkeling equipment, access to the sports and fitness club, and an hour of tennis court time daily. Guests will also be provided two bottles of water a day. They will also receive a 20% discount on select items at the Makana gift shop, and a 10% discount for lunch and dinner at the Bay Terrace Restaurant and Ocean Bar and Grill (this excludes special promotions, happy hour, and special events). At the golf course, resort guests are eligible for a 10% discount on non-sale merchandise at the golf shop and give a junior golfer (under the age of 15) the chance to play free with a paid adult. There are three restaurants for resort guests to dine at while visiting the Mauna Lani Resort. For breakfast, guests can dine at the open-air Bay Terrace restaurant. Breakfast is served daily and can be ordered a la carte or from the extensive breakfast buffet. Also, Sunday’s at the Bay Terrace feature a crab feast buffet for dinner. Lunch and a cocktail menu are served daily at the Ocean Bar and Grill. The poolside restaurant has a menu including made to order burgers, fresh island salads and peel and eat shrimp as well as smoothies and cocktails. The Canoehouse is located right on the Pacific Ocean coast. The menu was handcrafted to provide guests with authentic regional Hawaiian cuisine with a focus on local, sustainable ingredients with an artisanal flair. It is open for dinner and cocktails. Thursdays, Fridays, and Saturdays, resort guests can upgrade to the Captain’s Table for a blind tasting menu. Each meal is designed with at least 85% local ingredients, which are served and explained by the Chef de Cuisine. The Mauna Lani Resort features a full-service spa that is open from Tuesday through Saturday. The spa offers hair salon services including haircuts, hair styling, coloring services, and conditioning services. It also offers many different nail care services, like multiple types of manicures and pedicures and hand and foot treatments. They also offer waxing and facials. The spa portion of the resort has a host of Hawaiian and Aquatic spa treatments, body treatments, and massage therapy. Packages are available, and additional enhancements can be added to any service. A lava sauna is also available. For fitness, resort guests have a variety of options. The on-site sports and fitness club has state of the art fitness equipment (both cardiovascular and free weights), elective fitness classes, and a lap pool. It is open seven days a week. Guests can also work out in the outdoor fitness garden and enjoy the outdoor whirlpool. Personal trainers are available. Steps away from the sports and fitness club is the tennis club, which features six tennis courts for guests to use. Lessons are available, as well as game clinics. Additional fitness classes related to tennis are also available, and complimentary beverages will be served courtside. A variety of different water sports and activities are also available at the resort. Guests can contact the resort staff to coordinate any water-related activities, which can include a cruise on a 50-foot catamaran, snorkeling, boogie boarding, whale watching, stand up paddle boarding, and more. Rental equipment is available. There are two different championship golf courses located at the resort - the North and the South courses. Each course was uniquely designed to provide a different experience. Multiple golf tournaments are held at both courses throughout the year. There is also a Troon family golf course, which is nine holes. The course was designed for junior golfers and their families, and complimentary instruction is provided. One of the unique options just for kids at the Mauna Lani Resort is the Kid’s Camp, which is also known as Camp Mauna Lani. The camp is meant for children between the ages of 5 and 12 years old and features activities that change on a daily basis, so each day is a different experience. Children can explore the tidal pools, view the petroglyphs, play Hawaiian games, and do Hawaiian crafts.